Number of championships: Serie A – 3 times; Serie B – 1 time. Number of Cup wins: Coppa Italia – 9 times, Suppercoppa Italiana – 2 times; Inter-Cities Fairs Cup – 1 time; Anglo-Italian Cup – 1 time. * Book Official AS Roma Tickets Now! * AS Roma Tickets Have High Demand, Don't Miss The Opportunity. * AS Roma Tickets Are 100% Guaranteed. AS Roma, often shortened to "Roma", are a professional Italian football club based in Rome, Italy. Although they are sometimes referred to as "I Giallorossi", which means "The Yellow and Reds", due to the club's home colours: Tyrian purple and gold. AS (Associazione Sportiva) Roma was formed in 1927, the result of the merging of three Rome-based football clubs: Alba-Audace, Fortitudo Proroma and Roma Football Club. Despite the merge, the club's start was inconsistent, as several of its key players left it during the 1930s. Roma brought it back at the beginning of the 1940s, during the 1941-42 season, winning the Serie A for the first time. However, the years after WWII were difficult for the team, and it was relegated in 1951-52. The 1960s were more successful for Roma, as it won the Inter-Cities Fairs Cup in 1960-61 and the Coppa Italia twice, in 1963-64 and in 1968-69. A lull occurred in the 1970s, but in the 1980s Roma bounced back into action: in 1979-80 it won the Coppa Italia, Serie A in 1982-82, the Coppa Italia again in 1983-84, and once again in 1985-86. In 1984 Roma finished as runners-up in the European Cup final. The 1990s were quiet in comparison, but in 2000 Roma won its third Serie A title, largely due to legendary team captain, Francesco Totti. The rest of the decade turned out just as well for Roma, as it won two Coppa Italia trophies, two Supercoppa Italiana titles, and returned to the UEFA Champions League quarter-finals. During the years 2010-2015 Roma has gone through many changes in ownership, management and players, but not always for the best as achievements at home or in Europe have been few. 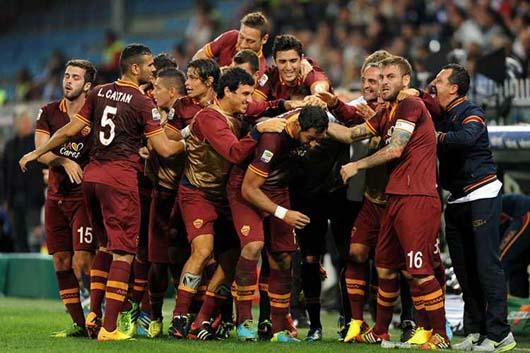 What is AS Roma's Most Successful Period? With the emergence of legendary team players for Roma in the 2000s, the club were back on their winning streak. The decade saw the team win two Coppa Italia trophies, two Supercoppa Italiana titles, and returned to the UEFA Champions League quarter-finals. How to Buy AS Roma Tickets on Ticketgum? Highlight an AS Roma game that you would like to attend from the menu above. Select your seat position and update the ticket quantity accordingly. Input your delivery address - a home address or hotel if you are away from home. Enter your email address: create an account or log in with an existing account. Agree to the terms and conditions to continue. Opt for your preferred payment method and confirm your ticket purchase. Look out for a confirmation email in your inbox.